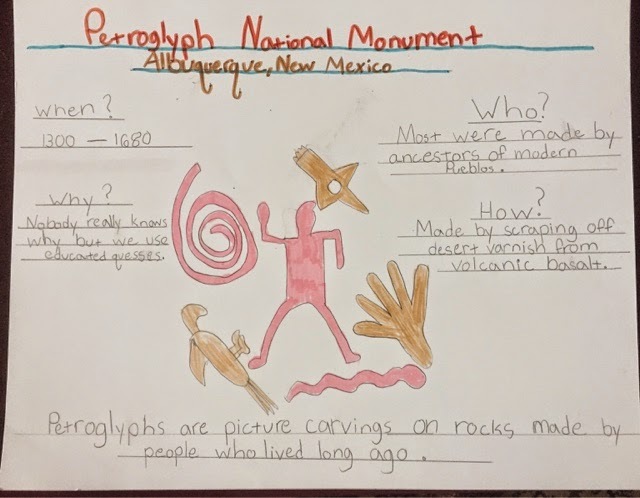 My last post was about our trip to Petroglyph National Monument. The next day, I gave A the option of either writing a paper or creating a mini poster on the Park and interesting facts she learned. She decided on the poster and worked hard on it, doing more research by reading the guide book we picked up at the visitor center for a dollar. We both found it fascinating how petroglyphs differ from cave paintings. Petroglyphs are made by actually scraping off the desert varnish which oxidizes on the volcanic rocks. Walking through the park, you could almost see the people of long ago scraping ever so carefully these designs into the hard stone. Amazing!